Free Online Course: Planning For Data Collection! We’re super excited to announce the launch of the first online course from the SocialCops Academy — Planning for Data Collection. Sign up here. Master the basic concepts, tools and tips you need to create a stellar data collection plan for your organization in this online course. Learn how mobile-based data collection can help you save time, reduce costs and optimize resources in your next data collection exercise. What can you expect to learn in this course? With this free online course you will be able to build a robust data collection plan, which will help you capture data about your program, monitor its performance and measure its impact! This course is suitable for independent researchers, field managers and program officers from nonprofits, philanthropies, governments and other development organizations who are looking to use data to monitor their programs, track their performance and measure impact. This course will help you create a basic data collection framework for conducting baseline surveys, market research studies, program monitoring and evaluation, etc. Get started with the course here. What all does this course cover? By exploring the fundamentals of data collection — such as distinguishing between identifiers and subject-related information and figuring out how to measure indicators for each — you can create an effective strategy to capture the exact data point you need in the most time, money and resource-efficient manner. The course will also dive deep into the benefits offered by mobile-based data collection technologies, such as better speed, higher accuracy, lower costs and richer data, and explore different mobile-based data collection technologies like Interactive Voice Response System (IVRS), SMS or Interactive SMS (iSMS) and app-based mobile data collection tools. Absolutely nothing, for now! You can enroll in this course for free, access the video lectures anytime and anywhere, and learn at your own pace. So are you ready to start collecting data like a pro? Sign up here! I am really very happy to see this course but it would be good to see the courses like monitoring and evaluation,health research fundamentals,data analysis,data scientist courses. This course looks really interesting. Will you be doing a course later on about ‘data analysis’? We currently find this a challenge/ gap in our organisation. Until that course is up, try checking out our latest ebook on data cleaning: https://blog.socialcops.com/academy/ebooks/ebook-guide-basic-data-cleaning/. 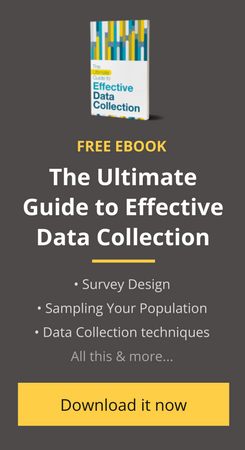 Data cleaning is the first step of data analysis, and our ebook covers the basics pretty comprehensively. Hopefully that helps a little!